The picture showed Kim Jong Un sitting at a table with military commanders standing behind him. In the upper left, on the wall, was world map obscured in the background with some barely visible Korean language characters and several arrows pointing to different parts of an unmarked global map. NKNews reporter James Pearson, with the eagle-eyed attention for out of the box details and curiosity which makes for a great reporter, didn’t focus on the staged people in the photo but on the aspects not designed by the propagandists who produced it to draw attention. One was the map in the top left hand portion of the photo. He translated the writing on the map which turned out to read “U.S. Mainland Strike Plan”. 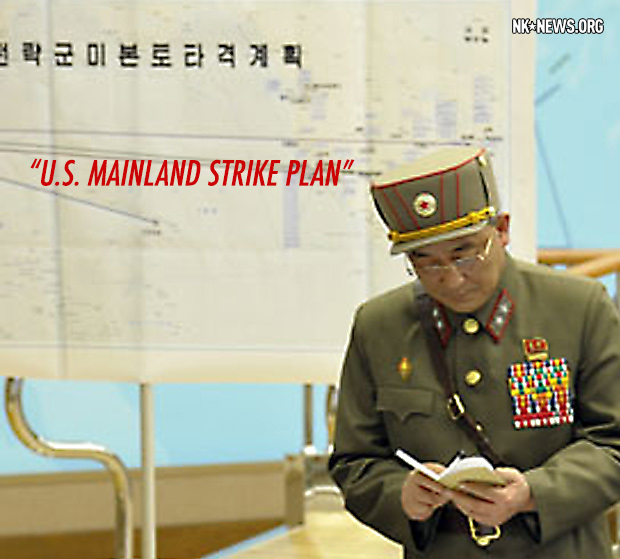 While this photo was released on the English language service of KCNA, whose target audience is enemy foreigners, it originally had appeared in the main North Korean Worker’s party organ, Rodong Sinbun, which targets North Korean citizens, and which often includes entirely different messages that the ruling party wants to send to its own population. What propaganda that appears in the North Korean language domestic press is very different than the propaganda meant for foreign consumption. Niether the map nor caption was either translated or highlighted in the KCNA English language broadcast photo. Pearson, who is in Seoul, also noted three blurry arrows pointing to spots on an unmarked outline of a world map. He, in coordination with NKNews journalists in Washington, superimposed a Google map of the U.S. on the KCNA unmarked map and located where exactly the arrows were pointing to. One pointed at Hawaii; one at San Diego, California; one at Washington, D.C.; and one at Austin, Texas. Austin Texas? The home of Willie Nelson, hipsters, the South by Southwest music and cultural festival, and great barbecue?